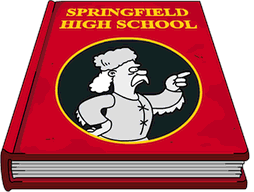 Make Springfielders Buy Doomsday Kits- x5. 3hrs. 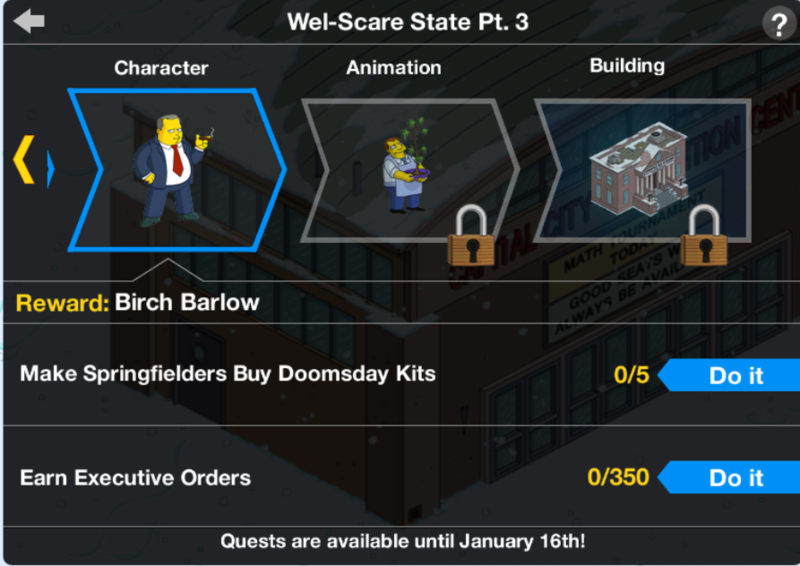 Birch does come with his own questline, however, he can also earn Executive Orders for the prize track. So use him to earn the EOs first, and then work on his questline. 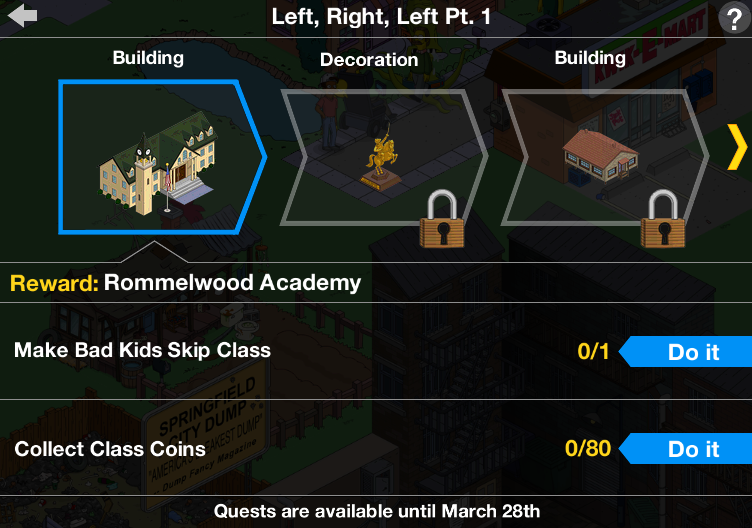 Here’s a look at his questline…. 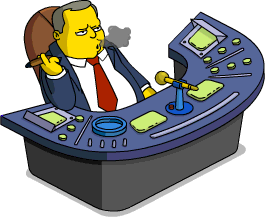 Birch Barlow: I can’t believe my radio show was canceled just because I said we should nuke Tax-achusetts and dump the ashes in Holly-good-riddance, Cali-won’t-mourn-ia. Those Politically Corr-wrecked Dumb-ocrats are so thin-skinned! Declan Desmond: Your unfiltered, tortured-wordplay-ridden ramblings are just what I’m looking for to start my radio production company! Birch Barlow: Whoa, there. I’m not about to bow down to some tea-bagging British sponsors. 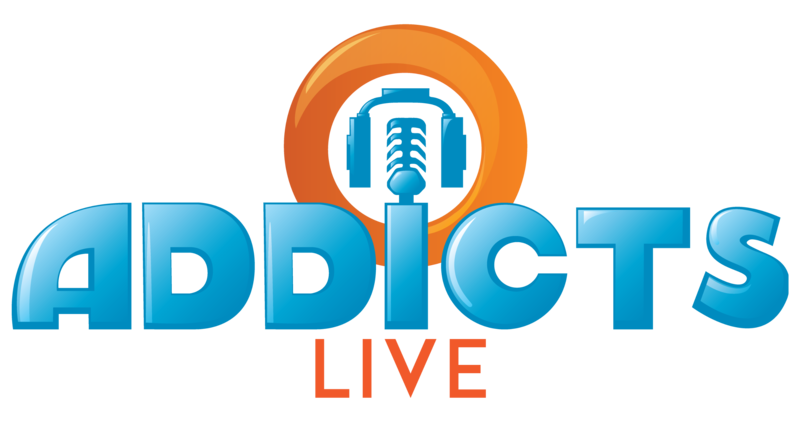 Declan Desmond: I’m talking about satellite radio — no advertisers, no censorship! Birch Barlow: You mean I’d be able to say whatever I want? You won’t sic the PC Police on me? Declan Desmond: No! I want your unfettered madness infecting our listeners. Nothing gets more subscribers than an extremist! How do you think Bob Ross got so popular? Birch Barlow: You have a deal. Birch Barlow: Good morning, freedom-likers. 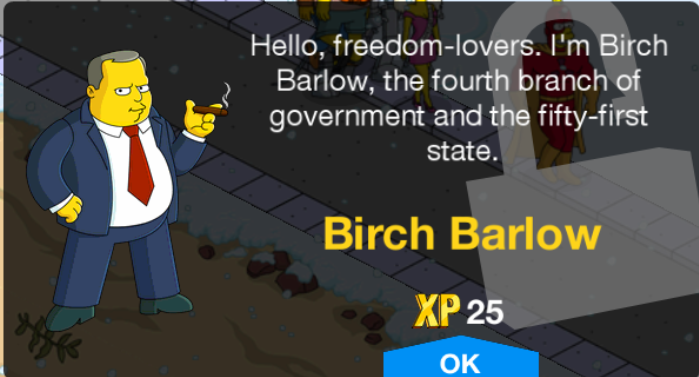 Birch Barlow, the fourth branch of government the fifty-first state, is back on the air. Today we are going to cover the proceedings on Bill HB-0101, a measure that would make False Flag burning illegal. But first, I know what you’re thinking: “Birch, how is it that Spend-o-Crats keep spending”? And that’s something that I’d like to know, too. We keep getting duped by a party who cannot align on which areas they are corrupt in spending? Call now, and let’s talk. Birch Barlow: “Fib-erals”?! What the hell does that mean? You’re talking jibberish; you aren’t making any sense. Sounds to me like maybe you’re a guest at the Greybar Hotel because you’re another one of those Liberal Lefties who packed his peace-pipe full of Wacky-Tobacky! Next caller! Birch Barlow: Good morning again, freedom-lovers. Let’s go ahead and jump right into it. The Capital City politicians are corrupt. I’m here on the inside, watching the way they work, like the little toy scuba diver in the fishbowl, surrounded by vicious clownfish. First caller! Moe: Uh, yeah, it sounds like there’s a lot of colludin’ going on behind our backs, under our noses, and in those hard-to-reach places I can never get to with floss. Is it safe to say that the Democrats have been lying to us this whole time? Did the moon landing not happen? Are they sulfur people from hell? Birch Barlow: *chuckles* My friend, you have a wild imagination…but you are absolutely right! We are dealing with SULFUR PEOPLE! Birch Barlow: Good morning, Americans. Today, I must announce to you that we are at war. The Dumb-ocrats are at it again. They think my show perpetuates “LIES” and incites “VIOLENCE”. Well, you know what I think? If it’s American to LIE to get your point across, then call me Bend-the-Truth Franklin! They set their demo-dog Mayor Joe Quimby on me. He’s attempting to organize a boycott. Well the only thing my listeners boycott…are FACTS! Birch Barlow: Whew. All this hateful rhetoric is really starting to take a toll on my health. *eats donuts* I don’t think I can keep this up much longer, I’m running out of faux outrage. Declan Desmond: Birchy, baby! There’s my little Republican-do. Your ratings are through the roof, and you have the most callers of any show I’ve ever produced. I want you to keep on spouting your Conserva-nonsense until you’re red in the face. Well, REDDER in the face. How about signing a long-term contract? Birch Barlow: I get to keep manufacturing rage while you pay me top dollar? Birch Barlow: You’ve got yourself a deal. It’s a pleasure doing business with you. Now get out of here, you job-stealing foreigner! He also has a 3hr task, but I believe it’s associated with the mini-event & may leave when the event is over. And that completes the details of the third Buck Stops Here prize! What are your thoughts on Birch Barlow? Thoughts on his questline? Tasks? Sound off in the comments below, you know we love hearing from you! 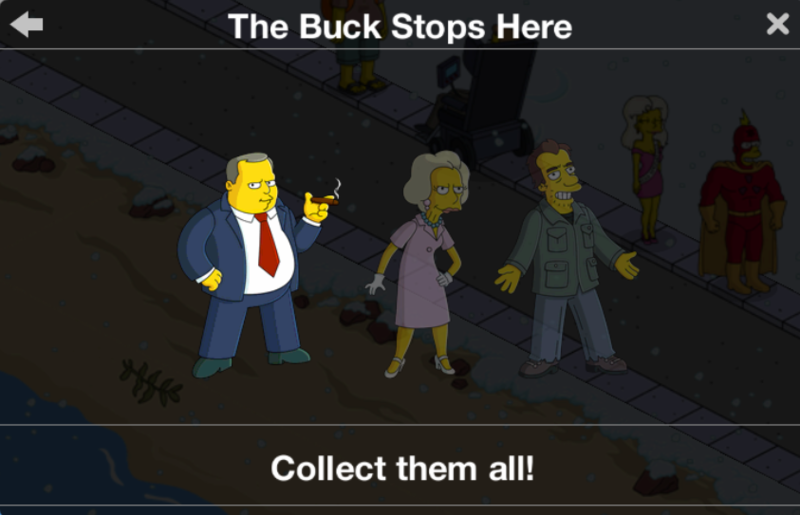 This entry was posted in Buck Stops Here, Characters, Tips and Tricks, Updates and tagged birch barlow questline, birch barlow tasks, Buck Stops Here Questline, How do I get Birch Barlow, Info Bores Questline, Tapped Out Mini Event, Tapped Out Tips and Tricks, The Simpsons Tapped Out, TSTO Addicts, TSTO buck stops here event, TSTO political Event, TSTO Tips and Tricks, Wel-Scare State Questline. Bookmark the permalink. The Bob Ross mention cracked me up. Right around the same time my niece posted on social media that she was looking for someone to recommend a good painter (they’re renovating their house), my son-in-law posted a pic of Bob, the whole family laughed. I love daughter’s husband! I would say he’s a great kid, but he’s 43 & has been through 3 tours in Afghanistan, so he’s no kid lol. My game kicked me out last night after I set hour tasks for everyone. 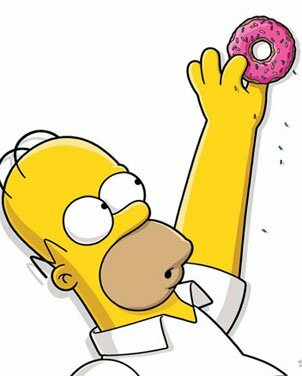 I’m missing out on a lot of money and donuts(farming) because my game can not connect to server. I’ve deleted and reinstalled the game 5 times to no help. Also for the past 2 weeks I haven’t been able to place water in the bottom two rows of my town. The water I did have in that location was removed and it will not allow me to pos d water there. Everything else can be placed there. I keep needing to redownload 1883.3MB, which takes forever-anyone else having this problem??? How do I fix? I cannot place water on the latest land EA gave us to purchase. Is anyone else having this problem? Yes for the past 2 weeks. They still haven’t fixed it. Loving this event! Keep up the great dialogue EA! 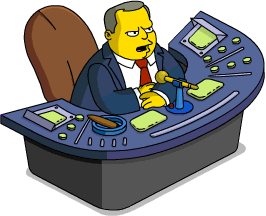 I’m glad to have Barlow in my Springfield but man is the dialogue worn out and tiresome. Server is down in Savannah Ga…been at least 2 hrs and reloading the game hasn’t helped. Anybody else unable to connect? Yes, unable to login here as well. CLT, NC. Down in North Georgia as well as of 5 p.m.
20:18 Eastern Time and still can’t get into my Springfield. Anyone else still having server issues? Definite server weirdness. 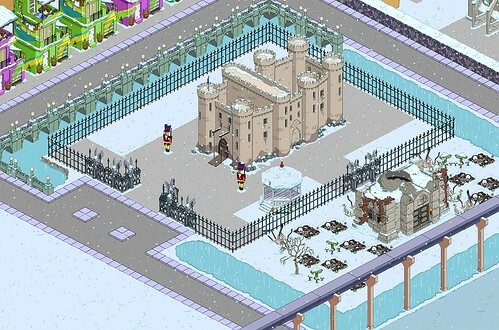 I haven’t been able to get on to my TSTO since about 5pm GMT. However my girlfriend has been playing hers with no problems. Anyone got any ideas? Got all the prizes but the animation eludes me, is it a task? The one with Quimby “Tend Dubious Plant” animation? I believe it is a task for Quimby which is 3 hours. I haven’t seen it in the game yet so I don’t know if he walks around Springfield with the plant or if he is in one place. Just popped in to say that we appreciate all the hard work that goes into running this site and you do a great job!!! Keep up the awesome work, and have a great 2018! The quest is to control the Latte market, so you need to be able to produce Lattes at the SH coffee shop. If the storage is full then see the SH items in store and spend some. The mini event is good, but when can we expect the main update? Either next week or the last Tuesday in January..that’s my guess. Any hints on what the event will be? My prediction is, Prohibition themed Event — especially since Brendon Beiderbeckie is a “rip off” of Bix Beiderbeckie- a Prohibition era musician.